I’ve said it before, but it’s worth rementioning: Palettes make makeup application so.much.easier. Dior’s latest, Dior 5 Couleurs in Ambre Nuit, part of the Tie Dye collection, boasts 5 perfectly pretty and earthy shades that are so wearable, you’ll be using these well into next year. There’s nothing trendy about staple shades like shimmering bone, velvety chocolate, barely-there peach, muted bronze, and dark chestnut. In fact, these 5 shades are so timeless and universal, you literally can’t go wrong with your pairing options. With a mixture of textures, you get to create dimension while still staying classic. 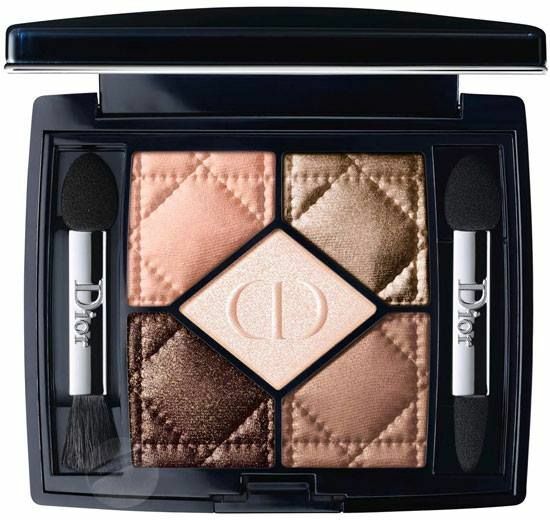 Plus, Dior shadows are one of my favorites because they are highly pigmented yet swipe with ease for color that lasts all day and night (literally). I like to create a smokey eye by applying the middle shade – the bone color – onto my entire lid, from lash line to brow bone. I then mix a dab of the velvety chocolate (bottom right) and the deeper chestnut (bottom left) and apply into the crease and below the lower lash line. I smudge out with my finger to give a more dramatic effect. Sometime, I stop here, and add a few coats of a thickening black mascara. Other times, I use either the peach hue (top left) or the bronze (top right) as my “pop” color and apply just in the middle of my eyelid. You can do this with your finger or an eyebrow brush. Another way to work the shades is to use just a wash of peach or bronze over the entire lower lid and then line upper and lower lash lines with the deep chestnut hue. It’s not a smokey eye, but it’s still dramatic. Finish the look with a dab of the shimmering bone hue on brow bone and inner corner of lids to highlight and emphasis. Get creative, the options are endless.